Afghanistan has been at the center of the geopolitical grand game for centuries. With complex local, regional and international interests overlapping, the prospects for security in the country remain uncertain. Can the Afghan government reach reconciliation with the Taliban and maintain independence from foreign influence? And how will it contend with the growing Islamic State footprint on its territory? Oksana is joined by the former president of Afghanistan, Hamid Karzai, to thrash out these issues. Oksana Boyko: Hello and welcome to Worlds Apart. The Graveyard of Empires it may or may not be, but Afghanistan has never ceased to be a battleground for local, regional and international players. What will it take for the nation to win the geopolitical Grand Game playing out on its own soil? Well, to discuss that, I'm now joined by the former President of Afghanistan, Hamid Karzai. Mr Karzai, it's a great honour to have you on the show. Hamid Karzai: Thank you ma'am, the honour is mine. OB: Now, Mr Karzai, it was reported in some western media that in the later years of your presidency, you couldn't wait to leave office, that you were tired of politics. And yet, since your retirement, you seem to be quite active. You visited India last month, I know, for the meeting with Prime Minister Modi, you're expected in Moscow later this month for a series of meetings, including the one with President Putin. It seems that you have become quite the eminence grise in Afghanistan. What are you hoping to achieve. HK: Well, unfortunately, it is true that Afghanistan has been the ground for great game politics now, for over two centuries. And with immense consequences and suffering for Afghanistan and for the region. Yes, you're right, I was in a great hurry to leave my office as the President of Afghanistan, and to begin life as a citizen of this country, to fulfil the constitutional requirements of Afghanistan. I'm not in politics. I'm simply trying to do what I can as a citizen of Afghanistan, to help my country and to help this region. OB: Well, Mr Karzai, as you said, you're not in politics, but you're a very, very influential figure in your country. And I think it's fair to say that the nature of the problems that your country is facing hasn't changed much since your departure. A political settlement with the Taliban still remains elusive. The relationship with Pakistan is still a source of tension. But your successor, Ashraf Ghani, has attempted to build a somewhat more functional relationship with Islamabad, something that you've been very, very sceptical about. You even went as far as to say that the recent agreement between the intelligence agencies of the two countries is “an embarrassment”. Why is it such a bad idea? HK: I'm very much in support of President Ashraf Ghani's efforts to build good relations with Pakistan. Pakistan is a neighbour of Afghanistan. The Pakistani people have helped us tremendously in the past 30 years, especially when we were fighting the former Soviet Union. The Pakistani people helped us tremendously, accepted refugees from us, and looked after us. But the story with the Pakistani military establishment and the intelligence establishment is quite different. Even when we were waging a resistance against the former Soviet Union, they were plotting to weaken Afghanistan and to fracture Afghanistan. Now, there is a difference between building a relationship with Pakistan and surrendering to the plots and machinations of the Pakistani intelligence and military. What I'm against is the agreement in which the Pakistani intelligence is given a hand in Afghanistan. That's detrimental to Afghanistan's interest. But I'm very much for improvement of relations with the Pakistani civilian government, with the Pakistani government. The Pakistani people are our brothers. OB: Well, Mr Karzai, Pakistan is not the only party that is playing this ambiguous or dual politics. The Taliban itself has been pursuing a rather complicated strategy of both talking and fighting at the same time. And I think it's fair to say that so far, this year, we have seen more in the way of fighting than in the way of talking. There's been significant losses on the part of both security and police forces in Afghanistan. It's believed that there is fighting in 26 out of 34 provinces. Is there even an incentive for the Taliban to pursue the talks? Aren't they on track to get everything they want by force? HK: Ma'am, those Taliban who are Afghans, who are from Afghanistan, they are our brothers, they are the sons of the soil, they are most welcome to come to Afghanistan and to participate in life as all other Afghans to. To rebuild the country together with us, to engage in the peace process. And I know for a fact for so many years that those Taliban do want to come back to Afghanistan, but they don't have the ability collectively to do that, because there are other forces in this region, including the one that I spoke about earlier, the Pakistani military and intelligence, that is stopping them from doing that. Now, peace process is a must for Afghanistan, and all Afghans are seeking it and supporting it. I very much wish, so as do many other Afghans, that there will not be fighting, and I hope that the Taliban will not wage any attacks in Afghanistan. I hope that they will immediately stop that. But it looks like it is not entirely in their hands. OB: Well, it is not entirely in their hands, partially because they also set pretty difficult conditions for the talks to proceed in. One of those conditions is, of course, all foreign troops, all foreign forces have to leave Afghanistan. Do you personally believe that if the Americans were to pull out of Afghanistan tomorrow, that peace would be easier to achieve? Do you think that would make the Taliban more willing to negotiate, or on the contrary, less willing to accommodate? HK: Well, that may make it easier for the Taliban to come and talk, if the Americans were to leave tomorrow. But that departure tomorrow may not necessarily mean immediate peace for Afghanistan. What I hope should happen is that the Taliban will give up their demand on the immediate withdrawal of US troops from Afghanistan, because that will not happen. Rather, I want the Taliban to come in and engage in peace talks with the Afghan government, with the Afghan people, and prepare the ground, through a strong unity of the Afghan people, for all the foreign forces to leave Afghanistan, and for this region then to help Afghanistan. By the region I mean China, Russia, India and other countries including Pakistan, including Iran, two of our neighbours, to get together so we can ourselves, in this region, bring stability and the progress that we all need to Afghanistan and to the region beyond Afghanistan. OB: Well, Mr Karzai, you just mentioned the geopolitical dimensions that the fight in Afghanistan has always had. And I would like to ask you a broader question. I don't know if you would agree with me, but I think, for a pretty long time, Afghanistan has served as a sort-of lab for trying out all sorts of geopolitical tools and strategies. And politics, especially geopolitics and especially in Afghanistan, has always been characterised by dramatic turn-arounds. You mentioned the fight against the Soviets. I know that you, in your younger years, you also helped fund-raise for the Mujahideen, you are now on your way to Moscow. So I think that shows us how enmities and sometimes alliances form and fall apart rather quickly. I think that in this time, this process has intensified, and it's much quicker than it was in your younger years. My question to you is, do you see any constants, any absolutes, any rules that all geopolitical players – and geopolitics is a dirty business, admittedly – do you see any rules that everybody has to follow, no matter what? HK: Yes. Ma'am, there are two clear issues here. One – the US and its western allies came to Afghanistan to wage war against terrorism, and to bring by that security to Afghanistan, to the region and also to their own countries. And this war has now been going on for 13-14 years, without the results that we all expected. Unfortunately, the Afghans suffered heavily in this war on terror, and terrorism and extremism rather than being defeated, or reduced, or eliminated, is steadily and widely on the rise. We have more radicalism today than we ever had before. We have more extremism than we ever had before. We have more terroristic activity than we ever had before. From Libya, all the way to Pakistan, India and China, and also Russia sees the consequences of that. So, the question of the fight on terror, I believe the United States – and this is something that I've been in discussion with US leaders for a long time, when I was the President, and I still raise this issue with them whenever I come across their personalities – that they should explain to the world whether they have failed in the war on terror, or if the war on terror has gone out of hand. And for that, there is the need for a very frank discussion between the US and NATO on the one hand, and the big powers, global powers, that are all in this region – Russia, China and India, and other countries – to see where we have gone wrong, if we have gone wrong. Now, as far as Russia is concerned, ma'am, Russia is a neighbour of Afghanistan by all standards. It has been a tremendous helper to Afghanistan even before the Soviet Union came into being, when there was the Tsarist Russia. Russia and Afghanistan had a very close engagement, and very close cooperation. We had that unfortunate period in our history, when the Soviet Union made the mistake of invading Afghanistan. But in that, we did our role to resist that invasion, and the Soviet Union tried its best to win. But the result was that both Afghanistan and Russia suffered. We did not get the gains of our victory, Russia suffered in other ways, and since then Afghanistan has been seeing great levels of instability. So, for us, a strong Russia, a powerful Russia, a Russia in close alliance with China and with India, is going to be a great factor of stability for Afghanistan and for this region. And that is what we are hoping to get soon, and that's what we should be working forward for. OB: Well, Mr Karzai, you were just talking about the need to have this frank discussion about the American war on terror. And I know that you've been long somewhat critical of the American involvement in Afghanistan. But in your farewell speech, you went all-out, calling the American mission a betrayal. You said that America didn't want peace in Afghanistan, because it had its own agendas, it had its own goals. What do you think those goals were? HK: Well, I certainly was very unhappy about aspects of American presence in Afghanistan, the way their military conducted themselves in Afghanistan, the way the war on terror was conducted in Afghanistan. They knew, and we know, and the world knew that the sanctuaries, the training grounds, the motivation factors for terrorism lay beyond Afghanistan, and they told us repeatedly that they were in Pakistan. But then the American forces would bomb Afghan villages, would imprison Afghan people and would hurt Afghan civilians. That was a strong point of disagreement between us, strong issue of disagreement between us. While I was strongly opposed to that, I also thanked the American people for the help that they have given Afghanistan, for education, for health services, for the building of roads and all of that. So, I'm not against relations with America. I'm very much for relations with the United States of America and its people, but I want the US military and the US strategic thinking in the war on terror to change its behaviour, its practice, as far as this war on terror and the fight against is concerned. OB: But Mr Karzai, just to make it clear, do you think it was the use of mistaken tactics? That the policy was right but the measures to implement it were wrong? Or is it, in fact, the policy? Because I think you used, on a number of occasions, the colourful proverb “running with the hare, hunting with the hound”. Do you think that, perhaps, the Americans indeed are not willing to side with either side in the conflict, simply because they don't believe that it's the right thing to do? In fact, the dualities in their policies have been seen all across the board, not only in Afghanistan or Pakistan, but all around the world. Do you think that policy of duality is indeed bearing fruit, as far as the Americans are concerned? HK: Yes, absolutely right. I very much believe there was a policy of duality, that they were running with the hare and hunting with the hound. And that's why there were these failures, and that's why there was this suffering for the Afghan people, and also for the Americans. So, what I spoke about earlier - which was about the frank discussion between the United States and world powers, and us in Afghanistan - was exactly to change this policy if they want to be sincere about the war on terror. They have to bring about change, they have to sit down for a sincere discussion. OB: Mr Karzai, we have to take a short break now, but when we come back – help or hindrance? Afghanistan has seen more than its fair share of foreign interventions. Can it emerge from the chaos if left to its own devices? That's coming up in a moment on Worlds Apart, stay tuned. Welcome back to Worlds Apart where we are discussing interventions in Afghanistan with the country's former President, Hamid Karzai. Now, it seems that we are living in this era of historic reinterpretations when current events are constantly likened and described in terms of what is happening in the past. You know that there are tensions between Russia and the West at the moment, and they are always described in the terms of the Cold War. Now, I've heard you say that you believe that a new version of the Great Game is on. I wonder if the rules of that game are any different from what they used to be? HK: I think the rules are not different. The rules are the same, the Great Game is unfortunately played the same way as it was during the Cold War, as it was played during the British Empire and the Russian Empire. The game is the same, only the players are more. There is a great, powerful China rising. There is a great, powerful India rising. There is Iran as a regional player, and there is Pakistan as a nuclear-powered country, and the United States presence and NATO actively in Afghanistan. So the game is the same, but the game has more players and is a lot more complicated. Now, there are some who are on the losing side, on the suffering side of this game. There are some who are trying to gain from this suffering that we have. I would, here, go to take a quote from President Xi Jinping from China, who said in the last [inaudible] meeting in Shanghai, that we can not have a world where one or a few countries are always secure, and others are insecure and suffer. Or to take from President Putin's remarks in this regard, that we can not have a world where some countries are always in trouble and downtrodden, and others always supreme and in the best of their lives and interests. This has to change. And this is inevitable to change. 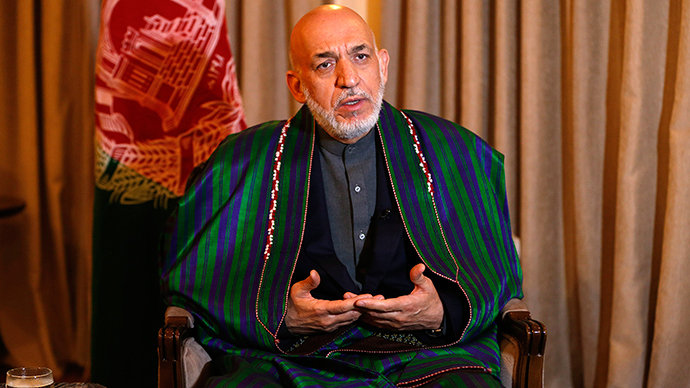 OB: Mr Karzai, but at the same time, we constantly hear from American leaders that, again, the US is a benevolent haegemon, that what they do is for the best interests of the world. And I heard you say on a number of occasions that presidents may change, but the state, the so-called deep politics or deep state stay the same. There may be cosmetic differences between Obama and Bush, but on the whole, the policies that their country pursues are still the same. Now, does it mean that regardless of who is elected the next President of the US, and regardless of any of the drawdowns, the US will stay as a powerful player in Afghanistan? HK: Well, ma'am, all states have deep states within them. Even Afghanistan, a poor, weakened country, has a core interest that it will not ever give up. So surely the US has that too, surely Russia has that too, surely other countries have that too. What I'm trying to say here, from the Afghan perspective, is that we are not against the US, we want to be friends with the US, but we want the US to be friends with Afghanistan in sincerity. That while it has bases here, it should not ever try, as it did after the collapse of the Soviet Union, when we succeeded, the US betrayed Afghanistan, left Afghanistan, and left us to the wishes and machinations of the Pakistani military and intelligence. That this time around, too, exactly today, the US should not repeat that mistake. It should not try to subvert our sovereignty to the Pakistani control, or subdue our authority and national sovereignty to the Pakistani control. That it should deal with us as an independent state, and from the point of view of Afghan interests. Other than that, we have no dispute. But, but, we want the US to be on good terms in this region, and internationally with countries like Russia, China, and India and others. Especially with regards to Russia, since I'm speaking to Russia Today, it's a Russian television channel. Russia is a value in this world, a recognised power in this world, a historic entity, and the [inaudible] should not try to weaken it, or do without. OB: Mr Karzai, I think your views will find lots of welcoming and responding ears in the Kremlin. I think the views that you are expressing are quite in line with what, for example, the Russian President may feel today. And especially given the conflict in Ukraine, I think there is also a sense of betrayal here in Moscow, that Russia did try to work productively with the West, only to see its security interests compromised and jeopardised, in the fashion that we saw in Ukraine last year. Now, my question to you is, it is clear that nobody wants to have the US as an enemy. But, given your long experience with the Americans, how do you think, what is the recipe for dealing with them in a positive way? How do you make sure you have this productive relationship, without allowing them to take you for a ride? HK: Exactly right. Now, I fully agree with you ma'am. I've had a great many engagements with President Putin on the issue of the US and the war on terror during the past 13 years. President Putin has been constantly telling me that there are many differences that Russia has with the US, but that Russia sees eye to eye with the US on Afghanistan, on the war on terror, and on the need to fight radicalism and terrorism. This view was expressed to me repeatedly. Where I had reservations, President Putin would advise me towards moderation. Now, only two years ago, President Putin began to think alike with me, that there has to be a shift in the way the war on terror is fought, that there has to be sincerity on this. And I fully agree with him on that as well. So, the world has to be looked at from the point of view of big powers, and also countries like ours, in a different light, where we all benefit, rather than one always gains and the other always loses. OB: Well, Mr Karzai, speaking about fighting terrorism and extremism, you know that there have been great concerns about ISIS or Daesh making inroads in Afghanistan. Just the other day, we heard reports about the beheading of at least 10 Taliban fighters by the so-called Islamic State. How much of a threat do you think they pose to Afghanistan's still-shaky security situation? HK: The Taliban, ma'am, are a fact of life in Afghanistan, they are part of our country, they are a part of our people, they've been here all along, they will be part of Afghan society, so we'll have to live with them and they'll have to live with us. But the ISIL or Daesh is not an indigenous product of Afghanistan. It is not raised in Afghanistan, and it is quite alien to Afghanistan. It is the result of events in Iraq and Syria, and the result of foreign interference in those countries. So, if there is ever the rise, or the strengthening, or the expansion of Daesh in Afghanistan, it will only be to go further to Central Asia, to hurt China, to hurt Russia. And it will not be ever possible without a foreign hand, without a foreign backing. So, if you hear ever in the coming days, or months, or years that Daesh is on the rise in Afghanistan, and is strong and expanding militarily, it will mean that it is a foreign-backed force intending to destabilise the region, particularly Central Asia, China and Russia. OB: But Mr Karzai, let me press you on that point. I wonder which agencies, you just mentioned foreign intelligence agencies, which agencies do you have in mind, which country may have such a broad geopolitical agenda of undermining Russia, China and Central Asia? HK: Well, if there is ever a thing like that, I know that, for a fact, there is no Daesh in Afghanistan, that it is not an indigenous product of Afghanistan, that it is not ours. So, if they ever rise in numbers, or in weaponry, or in military structures, that will mean, for us, a strong foreign hand backing them and behind them. That's all I can say. OB: Ok, you are being very diplomatic. I know that you've argued for a very long time that the question of terrorism can be addressed in a political, rather than military way, by removing the sources of funding, by removing motivation factors, you know, training grounds. And this is what some have argued in relation to ISIS or ISIL, that the US and perhaps its allies should have focused on changing the environment that breeds those terrorists, rather than trying to strike them militarily from the air. And yet the Americans, so far at least, persist in the military approach. Do you think, again, we are seeing the wrong choice of tactics, or is the policy of duality that we discussed earlier being on display here? HK: I think, to be brief on this question and to be precise, it is a policy of duality. That's exactly true, that is what I believe in. OB: Now, you've been long in favour of negotiating with the Taliban, you've even called them brothers on many occasions. Do you think ISIS could and should be negotiated with? HK: ISIS is an entirely foreign body to Afghanistan. They have not originated in Afghanistan. So, I don't think we can ever talk to them. The Taliban, yes, are a part of our country, we will talk to them. We don't have Daesh in Afghanistan, so there's no issue of talking to them. OB: Well, Mr Karzai, it's not a question about Afghanistan, it's a broader policy question. We usually think, or the media make us think about ISIS as this bunch of medieval barbarians who are slitting throats. And some of that is true, but what is also true is that a significant portion of IS fighters and IS commanders come from the Saddam Hussein's security forces, so at least some of them are educated and experienced people, who are certainly led by their grievances. But my question to you is whether you believe these kind of people could be reasoned with? HK: Well, ma'am, this will take us to Iraq and Syria. If Daesh in Iraq is indigenous and has arised, has gained force out of the grievances of Iraq, of the Iraqi people, then why not. The Iraqi government surely will talk to them. If the same is the case in Syria, sure, the Syrian government will have to talk to them. But if they are a force, even in Iraq and Syria, created by an outside force, used by an outside force, then they are there for the purposes of destruction by an outside force. In that scenario, definitely one cannot talk to them. OB: Well, Mr Karzai, this is a very interesting argument, unfortunately we have to leave it there. I really, really appreciate your time on the show. And to our viewers, please share your thoughts on our Twitter, YouTube and Facebook pages, and I hope to see you again, same place, same time, here on Worlds Apart.